Kay Heald is an HR Consultant with over 20 years’ experience helping businesses with their employment and HR issues. She is a fully qualified HR Consultant, a Fellow of the Chartered Institute of Personnel and Development and has worked with a wide variety of public and private sector organisations up and down the country. Kay started her career in London at the BBC, then moved into Public Relations, before moving across into the HR and training field, managing and nurturing people within organisations. Whilst working for a London HR and training consultancy, Kay developed her interest in specifically helping small and family businesses with their personnel needs: interpreting relevant aspects of employment law; providing practical and cost effective solutions to their problems; building long term working relationships with managers and their staff and giving busy directors timely guidance, support and training. In 2005, Kay relocated to Shropshire where she set up her own HR Consultancy halfway between Telford and Shrewsbury. She specialises in working with small, micro and family organisations. For over 13 years, Kay has worked as an HR Consultant with local businesses to find practical and tailored HR solutions to their personnel issues and problems. She keeps them on the right side of employment law and promotes good HR practice. Kay enjoys working with business owners, entrepreneurs and managers who recognise the importance of good people management in helping their organisations grow and prosper. Kay is a keen blogger, writer, social media networker and advocate for small and micro businesses, providing local commentary on relevant HR and employment law issues. Her work as an HR Consultant was externally endorsed in 2011 by the Midlands Family Business Awards, when she reached the finals in their Leading Adviser category and in 2012 when she was made a Chartered Fellow of the Chartered Institute of Personnel and Development (CIPD). Kay is a keen supporter of the successful local networking group, Network with Style, which meets regularly in Shrewsbury and has been a member of Women in Rural Enterprise since 2005. Kay has supported a number of local charities and sponsored the Dyslexia Awards ‘Best Supportive Employer Award’ categories for both 2016 and 2017. 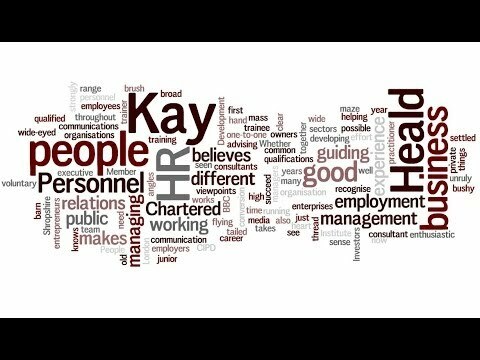 Kay is currently a member of the CIPD Shropshire Branch Committee, that helps develop, run and promote events for HR and personnel professionals. She is also a member of the Shropshire Speakers Committee, that helps build people’s confidence to become better communicators and leaders. Kay has spoken at a number of business networking events and within schools on a diverse range of subjects from ‘tackling unconscious bias’ to ’embracing introversion’.